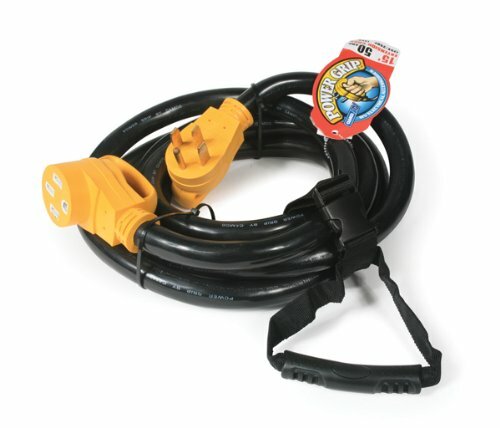 Camco's 50 amp 15 foot Power Grip Extension Cord features the patented Power Grip handles for ease of use. The 50-amp cord includes a convenient carrying strap. It is rated at 125V/250V, 12500 W and has a 6/3+8/1 STW cord. Safe and Durable Construction: Extension cord is constructed with 100% copper wiring coated with a heavy duty flame retardant, heat resistant PVC sheath that serves as protection from outdoor elements, wear and tear. Listed with CSA. Extended Length: Extends 15 feet long to provide sufficient length needed to reach distant power outlets and sources. High Conductivity with a Flexible and Sleek Design: Bendable extension cord adapter allows easy conversion from a standard 50 Amp male to 50 Amp female. Rated for 50 Amp - 125 Volts. Constructed with 6/3 + 8/1 gauge wires for greater conductivity. Simple Transporting and Organized Storage: Comes equipped with an adjustable cord organizer and carrying strap handle that makes toting and storing simple after each use. Multiple Uses: The PowerGrip Brand by Camco develops superior quality electrical equipment. Our extension cords and adapters provide excellent use at campsites, electric car charging stations and other outdoor use. Our products are compatible with most RVs, campers, trailers, and vehicles.